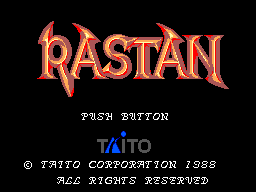 Rastan is a game made by Taito, a company who was very well-known for their arcade cabinets at (most likely) one of your local venues. Not only were they successful with making arcade games, but they also had their hand in the console gaming market. They've made many great games that have gone from one console to the next, and sometimes companies have a gem that slips by and is lesser-known than any of their other games. Rastan is one of these games. As the box tells you, you're a barbarian who has been hired by a king to rescue his daughter. Semia is the land that you have to battle through to get your riches... If anyone is up to this task, it's Rastan! Throughout the entire game, each level consists of battling your way through an outside territory towards a castle. When you reach the castle, you must battle through the stone walls of the fortress to find the leader of the level you're on. So essentially each level consists of three parts: Outside, Castle, Boss. In the outter portions of the game you will encounter many enemies that will try and prevent you from reaching the castle of the level. You will have to cross water by swinging, jumping, or by raft. If you are outside for too long, nightfall will begin to descend upon you. If that happens, it will be so dark that it's hard to see what you're doing... did I mention that bats will come out also? Being quick through the outside portions of the game will pay off. The boss of the round! There are quite a few bosses, each with their own special attacks, and of course, weaknesses. You'll have to fight everything from minotaurs to dragons (one of which takes up the entire screen mind you!). While fighting the bosses in each area, your life meter will slowly deplete. This is because the air in each bosses' chambers is poisonous... so it would behoove you to do your best to defeat them quickly! The whole game is set-up in the outside/castle/boss fashion except for the final level. In this level you'll have to go through three different castle parts, then the final boss. There is no outside parts, but luckily for you each part is relatively short. There are several ways that you can take inside these three parts, though they all lead to the same place. You'll find that you can even go through some walls and floors here! So what's the advantage that you have going through this perilous quest? Weapons and armor and power-ups, Oh My! Whenever you see any items, you should make it a point to pick them up. The only items you should avoid are the red vials. These are poisonous and will deplete Rastan's life meter. Luckily they don't do too much damage, so it's not a huge issue if you pick one up on accident. You can also get non-usable items in the game. Some of them will give you a boost of defensive power, some will give you points, and some will even fill up your entire life meter. The defensive items are like the weapons... they are limited time only; don't slack! The graphics in this game are pretty well detailed. There are no enemies that look exactly alike, so it's easy to tell what you're up against when you confront each baddy. The sprite detail is done very well on all the characters, including Rastan. Everything moves nice and fluently with no jerkiness. The backgrounds on the game are nicely done, with each scene looking different from the last. I don't recall much flicker (if any) and no slow-down in the game what-so-ever. The sound effects in the game are pretty decent, though nothing extra-special. The sound that your weapon makes when chopping an enemy is really cool... it adds to the collision effects in the graphics, which helps alot. I've grown to love the metallic sound of Rastan jumping, though at first I did find it annoying. The later bosses (dragons) let out screams when you hit them, which is a nice touch. There are essentially five different music scores in the game. There is the outside music, castle music, boss music, continue screen music, and ending music. They are all rather well done (i.e. not lame). All of them have enough catchiness to them that you don't mind hearing them through the whole game. The controls for this game are downright perfect and easy to pick-up on; the standard controller is used. Button 1 is used to swing your sword, and button 2 is used to jump. Of course, the D-pad is used to move your character left or right, and Rastan can also duck by pressing down. Pretty simple, no? Well, there are some other moves you can do! For jumping, you can hold up to jump extra high... in effect, if you hold up and diagonally left or right, you'll jump high and in the direction you are going. Be aware that you cannot control your jump. This means once you jump, you jumped, there is no going back. 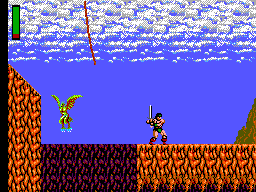 You must learn when to jump far (using the high jump) and when to do Rastan's basic jump. Your weapon can be used in more than a bi-directional flavor as well. 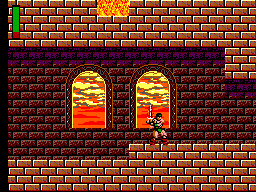 If you hold up and hit your attack button, Rastan will do an upward stab. This is a very powerful move, and deals alot of damage to the bosses. You might want to keep that in mind ;) You can also do a downward stab with your sword. Mind you, you'll have to be airborne to do this attack, but it's another method that you should get used to employing even for the regular levels. When in the air just push down and attack to perform it. Easy! With this being a platform-style game, there's not a whole lot you can do with taking different paths in the game. Being able to go different ways on the last level really helps, since it's fun to see if you can find any walls that you can go through. The fact that the game in itself is fun does aid to the replay value though. It's one of my personally most played SMS games to date, and I really don't think that will change. Trying to hurry through the castles so you have a special weapon at the bosses makes you want to try it again... and again... and again! So let's recap, shall we? Here is a game with good graphics, nice music, well put together levels, no glitchiness, easy controls, and fun. Sounds like a formula for a good game, doesn't it? Well, the formula does work. I highly recommend this game to anyone who plays the SMS, or maybe just getting into the Master System for the first time. This is the game that got me started. Check out this lesser-known gem and I think you'll enjoy your stay in Semia!